Now she is Eona, the Mirror Dragoneye, her country’s savior—but she has an even more dangerous secret. She cannot control her power. Each time she tries, she opens herself to the ten spirit dragons whose Dragoneyes were murdered, and her ability twists into a killing force. Worse, more destruction is on her trail, for she and her friends are on the run from High Lord Setton’s ary. They must find Kygo, the young Pearl Emperor, who needs Eona’s power if he is to wrest back his throne. But to help, she must drive a dark bargain with an old enemy, which could obliterate them all. 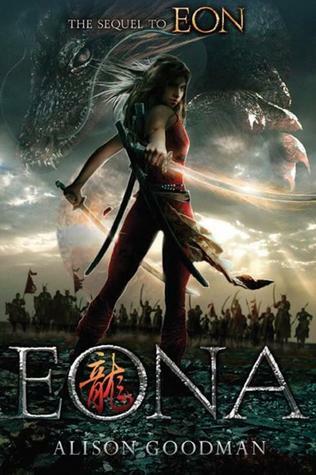 Eona, with its pulse-pounding drama, unforgettable fight scenes—and many surprises—brings to a close an epic story. After reading and loving the first book, Eon, I decided to pick up its sequel, Eona. Once again, I was far from disappointed. Eona has given up her masculine side and her hip has been healed, so she is quite a different character than she is at the beginning of Eon. It is also out that she is a girl, so in a world of men, she must struggle to be accepted. She must deal with the dark presence of her ancestress, Kinra (who was executed as a traitor) and the waking feelings in her heart. Throw in her struggle to control her power and one heck of a complicated love triangle and you’ve got one amazingly three dimensional character. Once again Alison Goodman is able to throw completely unexpected plot twists at her readers. She maintains an extremely fast-paced plot for over 600 pages, which is no easy feat. In addition to being fast-paced, it’s also complicated, meaning you really have to pay attention as you’re reading. Eona is one of those books you can read dozens of times and still find something you never noticed before. Alison Goodman’s world-building is amazing. She took elements from Asian countries like China and Japan rather than from the usual European suspects, to build her fantasy world. At the same time, she also takes old fantasy clichés everyone is familiar with (love triangles, for example) and puts her own spin on them. This is fantasy at its finest and I would highly recommend both Eon and Eona.